Home > Case Studies, Competitive Intelligence	> Forte 1 – truth or lie? A brief competitive intelligence case study. Forte 1 – truth or lie? A brief competitive intelligence case study. I received a phone call today from a charming lady who claimed to work for a company called Forte 1. I knew nothing about her company which seemed to want me to switch my business telephone line, and also said that they offered computers at great prices, and more. Whenever I get a sales call out of the blue, a red-light goes on in my head. At the same time I’m not one of these people that will put the phone straight down. For a start, I view it as an opportunity to practice my competitive intelligence elicitation and interviewing skills – how much can I find out about the unknown company. Very occasionally also, they get it right – and do succeed in making a sale (when it’s something I’ve wanted anyway and they offer a better deal). In the case of Forte1, alarm bells started ringing early on. I was considering putting the phone down but really wanted to know a bit more about the company and its service offering, especially as I was interested in one service that was mentioned and if the company was bonafide, I could have become a customer. Unfortunately the sales person wouldn’t give me a straight answer. I suggested that she mail me information on her company and if it was suitable for my needs I’d recontact her. Instead she suggested I look at their web-site. This gave me the chance to check up on them – and it’s an interesting lesson in what you can find on a company within 5-10 minutes, if you know how. It also showed that I knew more about her company than she did – confirming my suspicions that this may not be as genuine an offer as the salesperson was claiming. (However I don’t really know – or care. If any Forte1 users want to comment on this post and give a client reference please feel free). So what did I do? Well first, I went to their web-site – using Firefox (my browser of choice). ForteOne has applied a tactic of superb timing and entrepreneurial assertiveness to achieve success in the fields of communications through a vast array of business equipment solutions and information technology products and services. Our goal is to build long-term partnerships with our customers and maximise the potential of our traditional business, through a combination of enhanced quality of service and creativity. I’m not sure what this means. Although the words are English, the sentences are just a collection of management jargon put together to imply competence. For example, what on earth does entrepreneurial assertiveness actually mean. My next step was to find out more about the web-site itself. Using Firefox’s Page Info command (in the Tools menu) it turns out the home page was relatively new – from February 2009. So how old was the domain name – over to www.checkdomain.com (one of many domain checking services). That shows that the domain was registered on the 23 September 2008, as was the parallel domain forteone.co.uk. The US .com domain is owned by somebody else and is bonafide – but my suspicions are still high with the .co.uk domain – incidentally registered by a Mr W Ahmed. Next step – let’s check the address to make sure that this is genuine. So over to Google and enter the postal code and address: “268 Bath Road” “SL1 4DX“. Now that’s interesting – dozens of hits come up, including the Slough branch of Regus – the virtual office company. Lots of small and SoHo businesses will base out of a Regus branch, but it doesn’t add substance to the veracity of Forte1 – as their web-site description seems to suggest a large profitable business. Now let’s check to see if it is a real business – so over to Companies House and their web-check service. Enter in Forte 1 (expecting nothing but who knows) and hey-presto, up comes a real company – Company No. 06354706. So it is a genuine business after-all, assuming that this is the correct Forte 1. Only problem is that the address is different to the web-site (which doesn’t include the company number). In fact, there appear to be several changes to the record since this company was founded – in August 2007. It first appeared as Trus Com Ltd, then changed to Truscom Ltd before metamorphosing into Forte1 Ltd in October 2008. The company has also changed address twice – from a W2 4SA address in London to an address in Barnet on the outskirts of London. 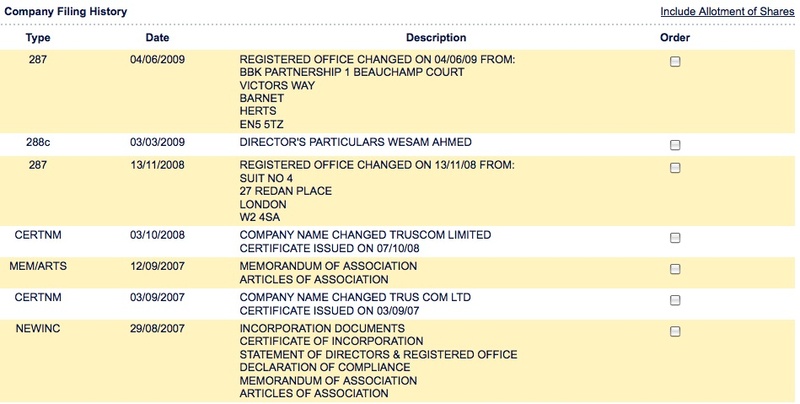 However the key line connecting the two – and confirming that this is the same company comes on the 3 March 2009 – where a 288c “Director’s Particulars” document is filed for Wesam Ahmed. Remember the name – the guy who registered the forte1.co.uk domain name. So what about that W2 4SA address – is that another accommodation address. SUITE 4 REDAN HOUSE, 27 REDAN PLACE, LONDON, W2 4SA. One is Motiontel Ltd listed on a D&B web-site, and the other is Nationtel Ltd listed on the excellent Applegate directory. Applegate lists the director – our friend, Wesam Ahmed again. Unfortunately a search on some of the people search sites doesn’t give much – as there are too many people with the same or similar name to research in 10 minutes. There are 5 domains hosted on this IP address. (In contrast, with forteone.co.uk there are 1000s – indicating that the server is shared and not dedicated). So it seems that perhaps Mr Ahmed is Egyptian – it’s an Egyptian name after-all. In conclusion – I can’t (and won’t) say whether or not Forte1 Ltd is genuine – with real products and services or not. Not having any experience of them apart from the phone-call it wouldn’t be fair to make a judgement. However from what I uncovered I won’t become a customer. Instead this can be viewed as a case-study in how it’s possible to do a quick competitor analysis while speaking to somebody on the phone – in a few minutes. With more time I’d have looked to see whether Mr Ahmed had more companies under his belt, and whether any had failed. I’d have looked into more depth to see who else (if anybody) was involved and tried to find some customers to give actual opinions on how they performed. This is the sort of work we do for clients – rather than just to satisfy curiosity, as was the case here.